This morning, Facebook reminded me that four years ago today, we laid Scudder to rest. And given my reaction to seeing that memory, the pain of his loss remains with me. Scudder was our black Lab. We raised him from puppyhood, through adulthood into old age, something like 16 years. That’s old for a Lab. And he was our faithful companion all those years, despite mishaps, antics, and whatever he did. We loved that goofy animal. Scudder was a couch potato, he loved being indoors, and hated nature. We once got a kiddy swimming pool and filled it with water. The other dogs took right to it. Not Scudder. He was in and out. In the mornings, I’d take him out to use the bathroom. Once he finished and he spotted the newspaper in the driveway, he’d make a beeline for it, grabbing it in his jaws. But it was with the softest touch. Never once did he tear it up, as he proudly bore it into the house, where, only reluctantly, he’d give it up. So in 2013, as the summer passed by, we knew something was wrong. He’d started limping, favoring a rear leg. Eventually, I began carrying him outside to do his business. He didn’t seem in pain, but we hauled him off to the vet, where we discovered he had cancer. His days with us were numbered. Of course, se did the humane thing, rather than wait and see him suffer. Today, however, he lives on in my heart, and in my books as Wolf’s favorite companion, Patton. Last Saturday evening, Jan. 21, I participated in my first author takeover hosted by the Facebook group Romance Readers Recommend. 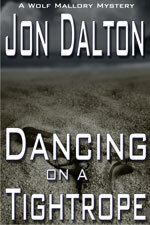 Of course, I was there u nder my romance author persona, Haley Jordan, but made it known that I was actually Jon Dalton mystery writer. My first take on the experience? It was like running a three-ring circus for my hour time slot. Upon a few days of reflection, there was at least one thing I could have done differently. And that was having some prepared comments ready to go that I could just cut and paste. That would have freed me up to engage more with the participants who were there. I’d already received the advice to have my bio, links to the book, some games and eye candy for the women attending, which I did have ready. I’m firmly committed to the belief that engaging with our readers, or potential readers, will bring an author far more goodwill than constantly hammering them with constant barrages of buy my book, buy my book. In this new digital world, for indie authors, engaging with your readers so they get to know you, feel a connection with you, will provide more benefits than we might think. After all word of mouth will probably help sell more books than anything else. Sure, I gave away, a few copies of the book as contest prizes, but hopefully that means I will get some good reviews out of it. I do know that I acquired several new friends, who will now receive my various status updates, which again lets them get to know me. So, if you have the opportunity, do an author takeover. Meanwhile, I’m contemplating doing one of my own.